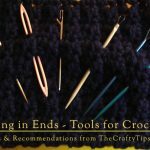 This week I’ve been exploring the various tools and techniques for weaving in your ends with knit and crochet. Today’s post is all about the Clover Darning Needles with Latch Hook Eye. 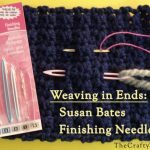 There’s also discussions about many of the different types of sewing needles I often use for weaving in ends as well as Finishing Needles by Susan Bates and wool needles. 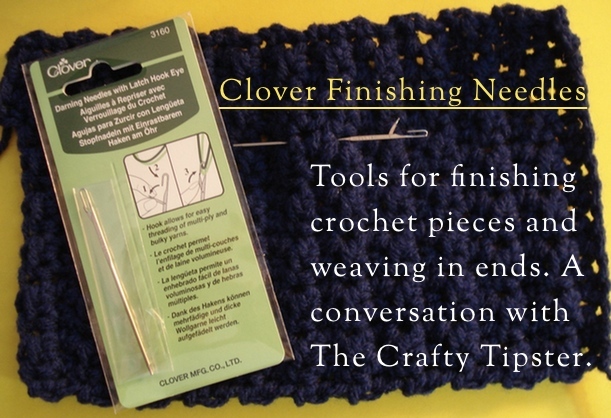 Clover Darning Needles with Latch Hook Eye are an interesting hybrid needle – part darning needle part latch hook of the variety used in making rugs with short pieces of yarn. They have a fairly sharp point and the smaller profile I was hoping for to use with thread and other fine yarns. I want to like these and yet, they have issues when using them to weave in ends with crochet or knit pieces. The Clover Darning Needles with Latch Hook Eye are sold by the pair. They are about 2.75 inches or 7cm long. The main part of the shaft is the closest, of all the aluminum finishing needles I’ve played with this week, to a traditional darning needle. Around 1/3 of the needle is flatter as part of the latch hook. The round part is just under 2mm wide, the flat part is about 2mm and the widest part of the hook section is 3mm. I’ve not used it much but the latch part does seem to almost snap into place and stay closed nicely. It doesn’t make an audible click but it feels like it does. These are a little harder to find than the Susan Bates needles, but they are an item that Amazon “ships and sells.” These can generally be purchased for $5-7. Can be threaded like a regular sewing needle. Or, you can open the latch, slip the yarn underneath the hook and click the latch closed. I love that it has a small and somewhat sharp point. Makes it much easier to split even fine yarns to weave in ends securely. Other than sewing needles, the yarn seemed to stay in these better than the other options. I didn’t have to keep re-threading it when weaving in ends. They are too long to truly compete with darning needles for me. Even with a fairly long tail to weave in, I often had to weave the needle into the crochet and then thread it. 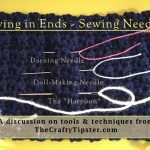 These have the bluntest tips of all of the brands of finishing, darning and wool needles I’ve tried. If you look closely at the tip, it’s actually flat. It is, however, still smaller than two of the wool needles I’ve tried and worked better than the Susan Bates needles. It doesn’t generally catch on the smoother yarns. But, it did snag some fluffy boucle I tested it with. They tend to push the thread forward rather than slipping in between the stitches; particularly with crochet thread. Some bulky yarns can be squished into the eye. However, you have to slide it underneath the non-moving part of the eye. It’s very easy for a stray fiber or two to escape and be outside of the eye. Depending upon the color and texture of the yarn, it’s hard to see if fibers are indeed outside of the eye. These needles are clever. I am, however, hesitant to use them after having them snag the yarn. I had hoped they would work with crochet thread. They generally do but are a bit big and rival my “Harpoon” (my favorite, but wicked, sewing needle) in length. I had mixed results with textured yarns. But, it might be a great option for smoother yarns like Red Heart Super Saver. 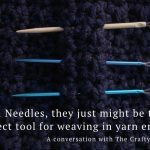 I’ll be keeping mine, but, will probably lean towards using traditional sewing needles and the new wool needles I’ll be talking about in my next post on Weaving in Ends with Crochet. Wool Needles, Where Have You Been All My Life? Next PostWool Needles, Where Have You Been All My Life?